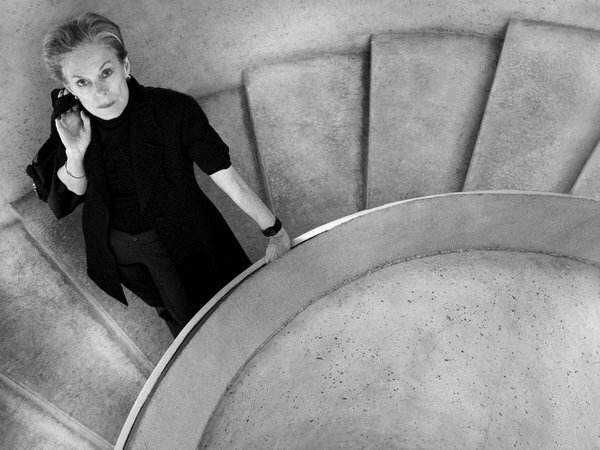 BERLIN – Approaching 75, choreographer Lucinda Childs carries her dancer’s body regally. Her high cheekbones and upturned collars reinforce the queenly effect. But though she’s a grand dame of American dance across Europe, her work has been more or less on hiatus in the United States until recently. Childs divides her time between Paris and the world, her current company based in New York and at least two revival projects touring regularly. 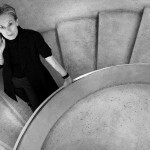 In the spring, she revised Available Light at the Massachusetts Museum of Contemporary Art, and Gehry, now 86, redesigned the set for the proscenium stage, making it portable for touring – with a platform above the main stage, staircases on either side, and a chain-link fence backdrop. It will be installed at the Drexel University Armory at 32d Street and Lancaster Avenue. Gehry was already known as a sculptural architect, but Childs was beginning to view her work in cinematic terms. In an early interview with Lazar, she pointed out how in film, information is shifted around, there is repeated action and backtracking to the original material. Since Stuccio brought Childs to Philadelphia five years ago, she’s reconstructed shorter pieces with Philadelphia dancers at the Performance Garage, performing them at the FringeArts space. She recently mentored local dancer/choreographer Megan Bridge for her piece based on Robert Ashley’s opera DUST in the spring. Bridge says “learning how to make a storyboard or score à la Childs” helped her greatly in her own work. I asked Childs whether I could see one. “Yes, they’re in the U.S. now,” she said, ultimately to be donated to a museum in Paris, “but I’ll send you the score that inspired Frank. . . . I don’t think a collaboration is artists’ giving each other an assignment” – though she did ask Adams for a piece at least 55 minutes long. She insists they are not just restaging a historical artifact; they are producing a fresh piece of art, molded by new spaces, vastly updated technology, and different, more highly trained and technically proficient dancers. “The dancers of today bring to it a certain style or quality,” she said. “This group has a more uniform look, and they are all ballet-trained.” They will include Caitlin Scranton, who so spectacularly performed Childs’ role in Dance, and the tall, lanky Ty Boomershine. Another festival favorite, Norwegian choreographer-director-playwright Jo Strømgren, returns with three diverse works, one of which, The Border, is less theatrical and very dancey, to use the technical term. It goes up against the three Available Light performances but at different times, making this “must-see” possible to fit your schedule. On the festival’s final weekend, David Zambrano will bring his frenzied, high-intensity Soul Project, with an international cast of virtuosic dancers performing solos to songs by artists including Aretha Franklin and James Brown. Another import, Still Standing You, with Pieter Ampe and Guilherme Garrido, promises to be the killer dance piece – or, if not killing, perhaps maiming. These two highly skillful dancers take (naked) male roughhousing over the edge. Bring an open mind. Of course, there is lots of terrific Neighborhood Fringe dance to look forward to, as well: it’s not me it’s you, by real.live.people.durham; Of Our Remnants, Olive Prince Dance; Arielle Pina’s Unarmed; 2000 Movements, Gregory Holt; Purgatory, Gunnar Montana; and, of course, American Standard by Brian Sanders’ JUNK. It just wouldn’t be Fringe without JUNK, would it? Available Light 8 p.m. Sept. 10-12, Drexel Armory, 32d and Lancaster Ave. The Border 9 p.m. Sept. 9 & 11; 6 p.m. Sept. 10; 2 p.m. Sept 12, FringeArts. 140 N. Columbus Blvd. Still Standing You 7 p.m. Sept. 9-11, Painted Bride, 230 Vine St. Soul Project 8 p.m. Sept. 18 & 19, Christ Church Neighborhood House, Second and Market.